The UK aristocracy brought back many souvenirs from their grand tours to Italy – pictures, sculpture, drawings etc – but also a delight in the architecture inspired by the ancient ruins. This fascination manifested itself in country houses across the UK with a profusion of arches, Serlian windows, porticos and pediments. However, one device, despite its impressiveness, has been notable by its relative rarity; the rotunda – that grand circular space often featuring a parade of columns leading the eye up to a spectacular dome. So why would this grand centrepiece be so infrequently used inside our country houses? The most famous rotunda, and that which was so influential on the Anglo-Palladians, was the Pantheon in Rome. Built in AD 124, this vast space under a 142ft diameter dome was closely studied by Andrea Palladio and became a key destination for UK architects who later travelled to Rome. Palladio then developed the use of the rotunda as the central circulation space in his residential villas, most famously with the Villa Capra or “La Rotonda” in Vicenza, begun in 1567. Palladio was not the first to use a rotunda in a residential setting; the artist Mantegna built his own home in Mantua in the 1470s using a layout and scale very similar to that later used at Villa Capra, using a design probably suggested by the architect-engineer Francesco di Giorgio. Palladio then modified it and used it to great success to create what is regarded as one of his finest houses. The rotunda would have neatly solved the challenge of the Villa Capra in that a visitor may at any front, thus negating the traditional linear plan which assumed only one main entrance. Looking through Colen Campbell‘s ‘Vitruvius Britanicus’ – a highly regarded collection of plans and prints of the best Georgian houses published between 1715-1725 – that over the three volumes a rotunda is only used twice. The first is in a proposed (but never executed) design for Goodwood House in Sussex for the Earls of March designed by Colen Campbell in 1724 which featured a 40ft diameter space. The second is the 35ft diameter version which forms the dramatic central hall of Mereworth Castle in Kent. Mereworth (built 1722-25) was one of only four Georgian houses to be built in the UK which closely followed the design of the Villa Capra; the others being Chiswick House, Middlesex (1726-29), Foots Cray Place, Kent (1754 – demolished 1949), and Nuthall Temple, Nottinghamshire (1757 – demolished 1929). A later use of the rotunda was at the slightly eccentric Ickworth House, Suffolk. Built in 1795 and based on the designs of Mario Asprucci, an Italian architect; it was later adapted by Francis and his brother Joseph Sandys who also oversaw construction. This later use of the rotunda showed how it could be employed as a single dramatic centrepiece in its own right, not hidden in the centre of the house. Yet, if it was hidden, it could form a dramatic and surprising irregularity to the procession of square and rectangular rooms which often dominated houses. One example of this is at Kedleston Hall in Derbyshire where Robert Adam was inspired by his own 1764 study of the ‘Ruins of the Palace of the Emporer Diocletian at Spalatro [Split]’ which paired the circular rotunda with a square vestibulum. Adam also later proposed to convert the courtyard at Syon Park into a huge rotunda. Perhaps one of the most impressive and beautiful expressions of the rotunda is the central staircase at New Wardour Castle in Wiltshire, designed by James Paine, and built between 1769-1776 and later described by Pevsner as ‘the most glorious Georgian interior of Wiltshire’. So, despite its impressiveness why are most entrances and staircases so determinedly right-angled? Simple finance can explain it in part; it would be more expensive to create a rotunda as they are more complex, require more space and also usually compromises in the floor plan to include the curvature. Fashion can also play its part. As architectural taste moved in the Victorian era towards a preference for the gothic, so the opportunities for the use of the rotunda diminished. With its origins in the temple ruins of Classical ancient Rome, the most famous Gothic Revival architect, A.W.N. Pugin (b.1812 – d.1852) considered it part of a more pagan tradition – and therefore completely antithetical to his belief that gothic represented the only true expression of Christianity through architecture. And where Pugin led, others followed. Or perhaps the answer is more pragmatic. One of the primary purposes of the country house was to impress visitors. Often a political power base, the grandest houses were designed to create an impression even before the visitor actually met the owner. As one of the principal spaces in a house, entrance halls have often played an important role in this domestic ‘theatre’ – and the use of a rotunda requires perhaps too many compromises. Traditionally the grand rooms where visitors would be met were often on the ground floor and would be processed through, with only the most important visitors reaching the best rooms. Elizabethan houses changed this with the principal rooms moving to upper floors, such as at Hardwick Hall in Derbyshire, requiring more impressive staircases which, through the use of heraldic and political symbolism in the carving on balusters and handrail could make many a statement before the guest reached the required floor. Palladian designs continued this with the preference for the piano nobile which moved the principle rooms to a raised ground floor. The large empty wall spaces of the staircase also formed a useful space for the display of paintings including family portraits or a large selection to show the owner’s taste and style. The staircase also provided a way to make a dramatic entrance – think ladies in their evening gowns gliding down to join the party. Yet if a house used a rotunda it compromised both these features. A curved wall made it difficult to hang the largest and most impressive works of art and staircases were usually spiral and tucked into the walls in the corners, meaning those coming down would only be seen when they emerged at the ground floor – which would never do. Yet, the rotunda has not died out and those with the vision and wealth can still create these dramatic spaces. One of the most impressive has to be Henbury Hall in Cheshire, built between 1984-86 for Sebastien de Ferranti and designed by the architect Julian Bicknell from a painting by the artist Felix Kelly. A faithful recreation of Villa Capra, the dome rises to 15m with the principal rooms radiating from the central hall. Nigel Anderson at Adam Architects also designed a replacement country house in Surrey which, according to them, is based (I’d say loosely – at least externally) on Villa Capra. Another fine example is that at Tusmore Park in Oxfordshire, winner of the best new building in the classical tradition award from the Georgian Group in 2004 where the scagliola columns in the central rotunda are said to rival those of the imperial palaces of St Petersburg. 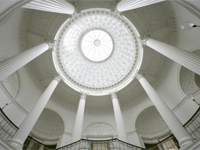 These examples show that, although comparatively rare, the impressive traditions of the rotunda are being continued by architects and clients determined to create the most dramatic interiors in contemporary country houses despite the compromises which have perhaps unfairly limited their use in previous centuries. This entry was posted in News and tagged a.w.n. pugin, andrea mantegna, cheshire, chiswick house, classical, colen campbell, demolished, derbyshire, earls of march, elizabethan, fashion, felix kelly, foots cray place, francesco di giorgio, georgian, georgian group, goodwood house, gothic, gothic-revival, hardwick hall, henbury hall, ickworth house, italy, james paine, julian bicknall, kedleston hall, kent, la rotonda, mantua, mario asprucci, mereworth castle, middlesex, new wardour castle, nigel anderson, nottinghamshire, nuthall temple, oxfordshire, palladian, palladio, pantheon, pevsner, robert adam, Robert Adam Architects, rome, rotunda, sebastien de ferranti, serlian, staircase, suffolk, sussex, syon park, tusmore park, villa capra, vitruvius britannicus, wiltshire. Bookmark the permalink. I so wish you wouldn’t use the word “demolished” so frequently in these posts……..it is almost more than I can bear! I am in therapy using “England’s Lost Houses” as a textbook but this word still stings. Sadly Jeff there were so many demolished that the word will crop up. Foots Cray suffered a serious but not what we would regard today as fatal fire – but in the post war years it was easier just to bulldoze what remained into the cellars. Nuthall Temple was eventually blown up. “England’s Lost Houses’ is both a wonderful memorial but also a terrible indictment of the way our architectural heritage was largely and needlessly abandoned. Is it really necessary to go along with the recent trend of deeming the word “British” to be insensitive? Can’t this blog be a haven from political correctness? In any case, the UK didn’t even exist in the 18th century, so your use of the term here is inaccurate. Hi Oliver – I certainly have no problem using the word ‘British’ and would certainly describe myself as such. Technically the United Kingdom came into existence with the Act of Union in 1707 so I think we can safely say that it was valid for most of the 18th-century! Admittedly we didn’t incorporate Ireland until 1800 but as all my examples are in the area covered by the original UK I think I’m safe. Didn’t the Kingdom of Great Britain result from the 1707 union with Scotland, with the United Kingdom of Great Britain and Ireland created in 1800? Yes, the 1707 Act of Union created the United Kingdom of Great Britain and then in 1800 we merged with the Kingdom of Ireland to become the United Kingdom of Great Britain and Ireland until the partition in 1921. After that, in 1927, the name was officially changed to be the United Kingdom of Great Britain and Northern Ireland. A fantastic post, Matt, particularly as the Palladian style is my favourite form of architecture, especially the entrance front of Kedleston Hall, and a good follow-on from the 2008 exhibitions celebrating the 500th anniversary of the birth of Andrea Palladio. I remember first seeing Mereworth Castle in the 1967 movie Casino Royale (1.30 to 3.05 minutes) where it featured in the beginning as the home of Sir James Bond (David Niven). Although I was slightly disappointed with the interiors of Villa Rotonda and Chiswick House when I first visited them because they were rather empty of furnishings (as intended as social group meeting places), compared to the family home interiors of Mereworth Castle and Henbury Hall. On a smaller scale, there is also Castle Howard’s garden pavilion, The Temple of the Four Winds (originally called The Temple of Diana) in Yorkshire, designed in 1724 by Sir John Vanbrugh, which was used for a scene in the 1981 TV series of Brideshead Revisited (6.45 to 8.40 minutes). There is also Stowe House’s more oval shaped Marble Saloon in Buckinghamshire, now restored with statue replicas. Other houses with significant rotunda-shaped wings include Windsor Castle’s Round Tower, Belvoir Castle’s circular Saloon Tower, and Culzean Castle’s oval staircase hall and drawing room tower.